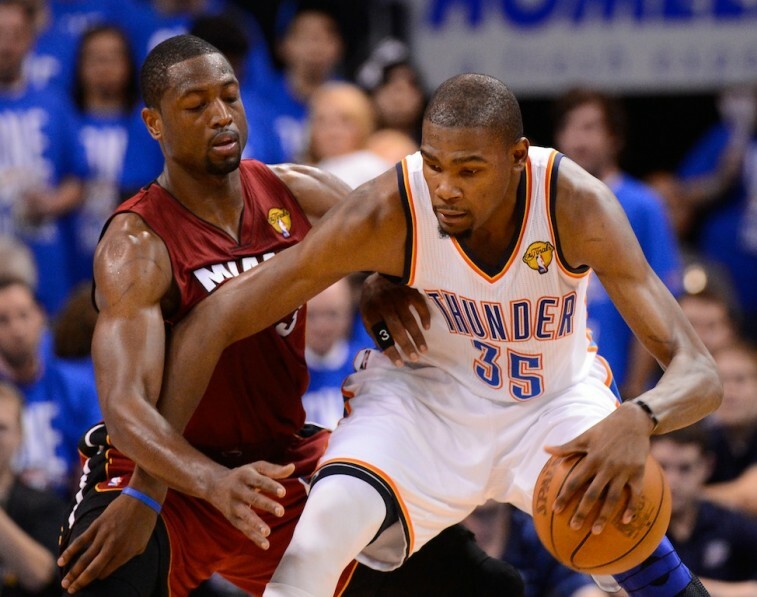 NBA: Would the Heat Slight Wade to Get Durant? On the eve of the 2015 NBA Finals, the conversation at hand should really be focused on the potentially classic matchup between the two best teams in the National Basketball Association. Will LeBron James, making his fifth straight finals appearance, lead this young Cavaliers team to the first championship the city of Cleveland has seen in 51 years? Or will Stephen Curry, fresh off his inaugural MVP season, catch fire and shoot the Golden State Warriors into the history books? This is exciting stuff. This should be enough to hold our attention. Should be. Isn’t. So it goes. What can we say: we’re voracious, and with the recent announcement that Dwyane Wade will be joining ABC’s coverage of the NBA Finals as an analyst, we can’t help but find ourselves drawn back into his current saga with the Miami Heat. 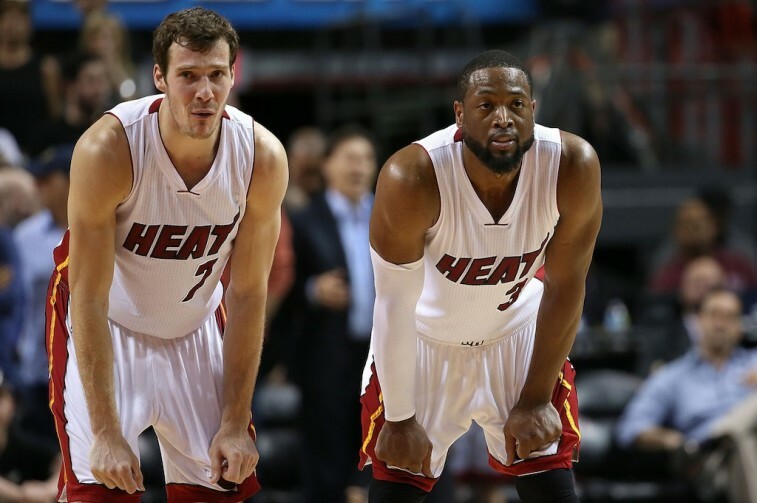 The Heat can have room for Wade, Bosh, Goran Dragic, Hassan Whiteside and Durant … but only if Wade opts in. It may seemed far-fetched to believe that the Miami Heat could actually afford to have a team made up of all these players. After all, the 2014-15 salary cap is $63.065 million and the luxury tax line is $76.829 million. However, things are going to change dramatically once the NBA’s new multi-billion dollar TV deal kicks in prior to the 2016-17 season. Based on what USA Today Sports was told by two people familiar with the projected estimates, the salary cap and luxury tax line for the 2015-16 season will be $67.1 million and $81.6 million respectively. Once the TV deal comes into effect prior to the 2016-17 season, the cap will increase to $89 million and the luxury threshold will become $108 million. These limits will, again, increase for the 2017-18 season, with the salary cap reaching $108 million and the luxury tax line rising to $127 million. It seems reasonable to think that, with these upcoming increases, the Heat could sign Dragic this summer, work out a deal with Whiteside the next (and give Durant the max), and still be in a position to take care of Wade. However, this wouldn’t be possible if Wade doesn’t opt into his $16 million deal for the 2015-16, and trust that the Heat will pay him accordingly when he becomes an unrestricted free agent prior to the 2016-17 season. In the end, this whole thing rests on Wade’s ability to take a leap of faith on the franchise he’s been with for his entire NBA career. No one can deny that a team made up of Wade, Bosh, Dragic, Whiteside, and Durant would be a strong contender for the NBA Title in the 2016-17 season. But it requires the face of its franchise to once again sacrifice his well being for team — something that’s become a refrain for Wade in the second half of his career, after sacrificing his alpha dog status and his max contract to form a Big Three with Bosh and LeBron James. If Wade were to opt into his 2015 contract, then the Heat would find themselves in a position to give Dragic a max deal this summer. If Miami were to come to terms with Dragic, then the only other big contract on the books for 2016 would be Bosh’s, at $23,741,060. Therefore, Miami would have plenty of room in the summer of 2016 to give Whiteside a proper deal, and make a run at the league’s biggest prize — KD. Of course, this could only happen if a lot of different scenarios fell into place. The first, and most important, is for Wade to buy in. The Miami Heat have the potential to become a “super team.” But this franchise also risks alienating a person who has done nothing but give himself up for the group. Just think about the fact that Wade played this past season on a discounted salary so the Heat could give Bosh a maximum deal, and you’ll soon realize that this has been the story of his entire career. 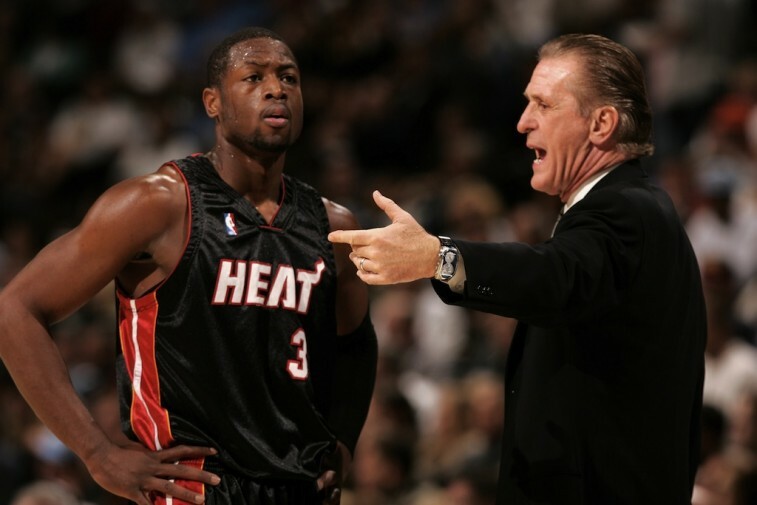 Should Wade be hesitant to trust Pat Riley and the rest of the Miami brass, he could decide to look elsewhere; perhaps a team that sees more value in him. If Wade bolts from Miami this summer, the Heat’s plans would most certainly unravel. With Wade gone, Dragic would certainly opt-out of his deal and sign elsewhere. The Heat would be miserable in 2015-16 and, again, find themselves with a lottery pick in next year’s draft. Good luck getting Durant to come to South Beach then. And yet, we’re forgetting the obvious: Does KD even want to play for the Heat? Riley seems to believe that all he needs is an opportunity to convince him. Perhaps his time would be better served reassuring the Flash that the organization has every intention of making things right. After all, without Wade’s cooperation, everything falls apart. Is it really worth the risk? All statistics are courtesy of Basketball-Reference.com and Spotrac.com.